When a fellow WeightWatcher friend of mine asked me if I could devise some 'pastry' using chickpeas a few weeks ago, I jumped straight to the challenge! They're a great way, blitzed down and mixed with a couple of other ingredients, to form the basis for both sweet and savoury pastry alternatives. I thought I'd start with my little savoury tartlets this time, then share my sweet egg custard version with you another day. (I know, I'm a tease)! They are extremely delicious, luxurious-tasting little morsels made rich by using egg yolk and yoghurt in the centre (the whites are used in the 'pastry'), so no annoying left-over whites or yolks to store. These little tartlets work out to 3pp/approx.140kcal each but of course, they are also Filling&Healthy and SimpleStart friendly! Tear the Warburtons sandwich thins then blitz into fine breadcrumbs. It's really important to do the breadcrumbs separately, otherwise they will absorb any liquid from the chickpeas and turns it into a glue-like paste. Tip the breadcrumbs into the mixing bowl with the chickpeas. Mix together thoroughly. Season quite heavily using plenty of dried herbs and black pepper. This reduces the prominent taste of the chickpeas and gives the 'pastry' a great flavour. Experiment by trying garlic, chilli, fresh herbs etc in your own version. Add the egg whites to bind the dry ingredients together. While the 'pastry' is chilling, make the filling for the tartlets. Fry the sliced leeks in a little Frylight oil and a dash of soy sauce until soft, then add the sliced baby asparagus. Season to your personal taste. Mix the egg yolks, 2 whole eggs and the yoghurt together. Whisk well with a little hand whisk to ensure no lumps. Add chopped chives, black pepper and whisk again. Spray a Yorkshire pudding tray with Frylight oil then divide the 'pastry' mixture into 8. Using your fingers, gently press the mixture into the indents and up the sides to form a lovely thin, even tartlet shape. Bake for 10-15 minutes at 200C/400F/Gas6 until crisp and golden. Allow to cool slightly, then gently loosen the cooked shell out of the tin using a knife or spatula to release it. Keep it in the tin-this just ensures it won't stick after the final baking. (Larger ones will require a longer cooking time). Distribute the cooked vegetables between all the tartlets. Using a measuring spoon, carefully add the egg/yoghurt mixture to each tartlet to cover the vegetables. Go as near to the top of the tartlet as you can. Very carefully, place the filled shells back into the oven and bake for a further 10-15 minutes until the egg has set. The 'pastry' should be lovely and golden and the centre firm, baked and glossy. Serve warm or cooled with lashings of salad. Play around with different fillings-smoked haddock, smoked salmon, chicken, ham, mushroom, tomato, onion-the world is your oyster! Just remember to add propoints if your ingredients aren't on the Filling & Healthy list. 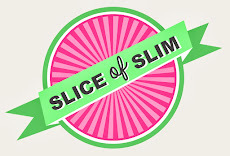 Fresh from the Slice of Slim kitchen!